In 1912 Robert Fabig had introduced the Imperial typewriter on the German market, under the name Faktotum. In 1921 he introduced a similar downstrike machine, the Rofa, with one major difference: inking was done with an ink roll. Fabig felt that the ribbon mechanism was a major source of problems on other typewriters. So he came up with a cheaper system that also kept the operator's fingers clean. The system consisted of an ink reservoir with a roller. The type would hit the roll, which then hit back against the reservoir for a refill. 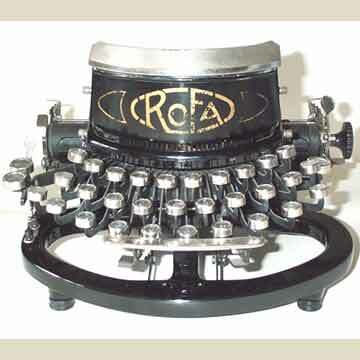 Commercially the Rofa was a considerable success in Germany. It was also exported to the Netherlands, with a different brandname: the Correspondent.